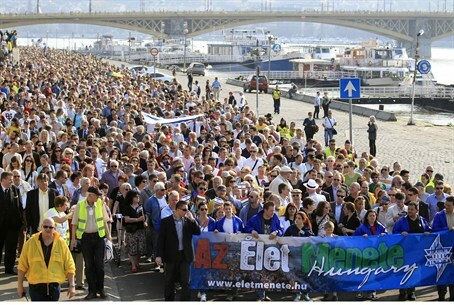 A record 10,000 Hungarians take part annual march to commemorate the victims of the Holocaust. A record 10,000 Hungarians took part Sunday in an annual march to commemorate the victims of the Holocaust, amid recent reports of increasing racism and anti-Semitism in the country. Over 10,000 people, more than double the usual turnout, participated in the "March for Life", according to an AFP count, alongside government and opposition members, and the ambassadors of Israel and the United States. "It's important that future generations also learn the lessons from the Holocaust," organizer Laszlo Bandi told the crowd at the start of the event in downtown Budapest. Hungarian Jews have reported increased verbal attacks in the past year and observers have accused the centre-right government of stoking anti-Semitism, paying tribute to wartime leader Miklos Horthy, an ally of Adolf Hitler, and rehabilitating a number of anti-Semitic writers. Last month, a state honors list for cultural personalities included a prominent television presenter and a musician both known for anti-Semitic and racist views. A small group of neo-Nazis tried to disturb Sunday's march but was dispersed by police. The interior ministry already banned last week a neo-Nazi biker parade, dubbed “Give Gas,” that was planned to coincide with the Holocaust memorial. Budapest police said it would deploy “all legal means” to stop the rally by bikers, whose “provocative” name and timing is “an offense,” according to a statement. The European Jewish Congress (EJC) recently identified Hungary as experiencing the most troublesome racist and anti-Semitic trends in Europe. “There are extremely worrying signs emanating from Hungary at the moment, where barely a week passes without an attack on minorities or outrageous comments from far-right politicians,” said EJC President Dr. Moshe Kantor. The prevalent anti-Semitic trends in the country are most widely attributed to the Jobbik political party, which espouses blatantly neo-Nazi and xenophobic principles and beliefs.